Our clothes washing machine sits in the middle of our kitchen/living room, next to the sink. Since we first moved to Moldova almost 7 months ago, it has been a favorite form of entertainment for Jude. 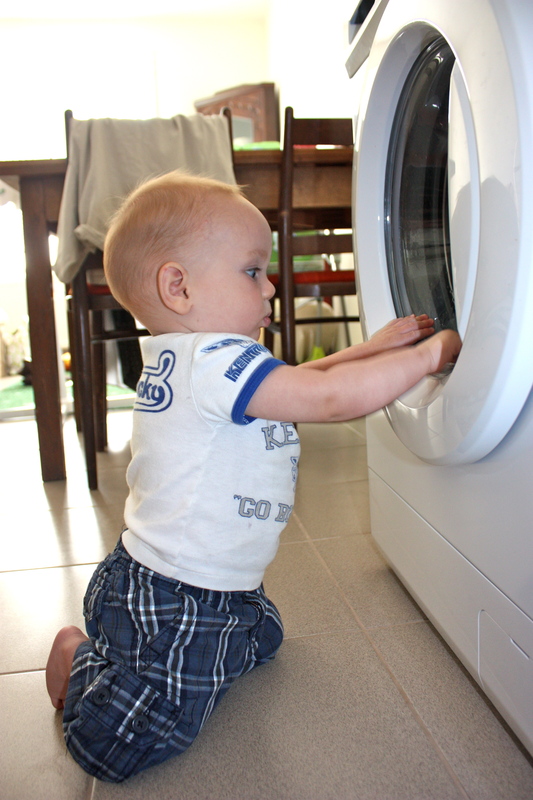 He loves to watch the clothes spin around when it is going, and when it is not going, he likes to put toys in it and hear them clank around on the metal drum. Now that he is getting taller and walking independently, he has discovered the buttons and dial along the top of the machine. No big deal, the machine comes with a child lock feature so that none of the buttons or the dial work… or so we thought. Jude quickly discovered that there is one button that isn’t affected by the child lock—the POWER button! So even with the child lock turned on, he can walk over and turn the machine off in the middle of a cycle. Seriously… who designed that? ?